Machamangalath Traders (MAM Traders) is one of the prime sources for Betel Nut / Areca Nut from central part of Kerala, INDIA. We source and procure good quality Betel Nut from reliable vendors and farmers strengthened by a strong sourcing network which ensures timely delivery across the nation. 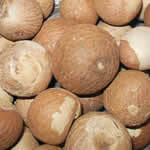 Looking for Betel Areca Nut?